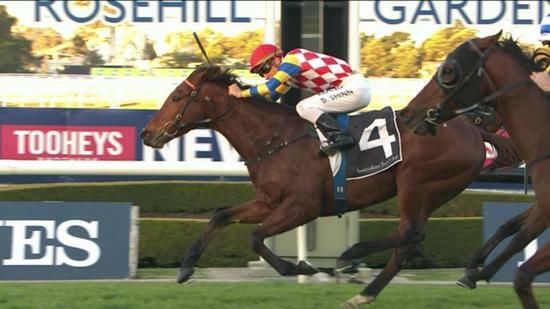 Locals could only watch on in awe as Manolo Blahniq surged to victory at Rosehill this afternoon for Mornington-based trainer Tony Noonan who made the trek up from his Victorian base to win the final race on the card. “The step up to 1300m suited us nicely and Blake (Shinn) gave him a gem of a ride,” said Noonan. “The drying track helped us today. We had originally planned to run at Swan Hill last week but when they got track downgrades throughout the day, we scratched him late and went back home to Mornington. Returning to Sydney for the second time in a month, Noonan had always picked out targets north of the Victorian border for this 4-year-old gelded son of Jimmy Choux. “Jake (Noonan) does a lot of work on him at home which is been key to the horse settling as well as he did today. “He galloped him at home on Tuesday in the reverse direction and thought the horse was spot on for today. Jumping well from barrier 8 in the field of 15, Shinn found a lovely position to settle midfield behind a strong tempo. Gradually working into the race, Manolo Blahniq was given a soft trail in the 3-wide line into the home straight before Shinn peeled out towards the centre of the track, spotting the leaders five lengths. With plenty of galloping room, Manolo Blahniq ($5.50 EF) let down with his booming turn-of-foot to hit the lead by the 100m mark and hold off the fast-finishing Pianissimo ($12). The win was the third of Manolo Blahniq’s career, taking his prize money earnings past $245,000.